It has been three decades, with more than a million editions sold, since the GSX-R line was born. And a decade and a half has elapsed since the first GSX-R1000 transformed the open sportbike class forever. Now, the 2017 GSX-R1000 is redefining what it means to be The King of Sportbikes. 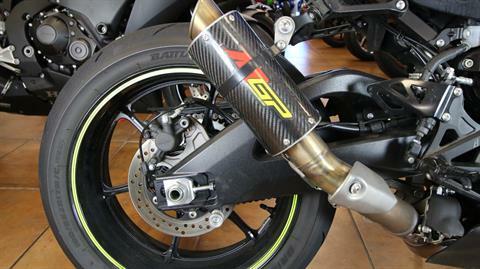 All-new from its sticky tires up, the GSX-R1000 exudes MotoGP influence. 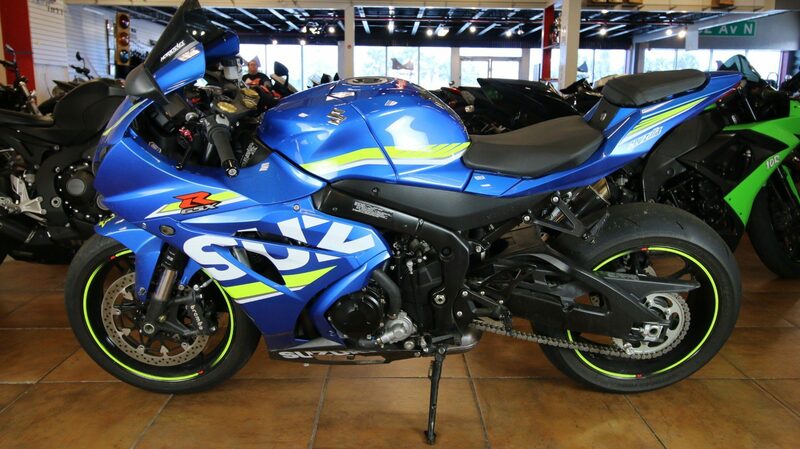 From the class exclusive Variable Valve Timing (VVT) system that helps deliver a broad and strong powerband, to the compact cassette transmission, a 32-bit dual-processor ECM, 10-level traction control system, and wind tunnel tested aerodynamics, the GSX-R1000 was designed with one idea in mind, to regain the “King of the Sportbikes” crown. 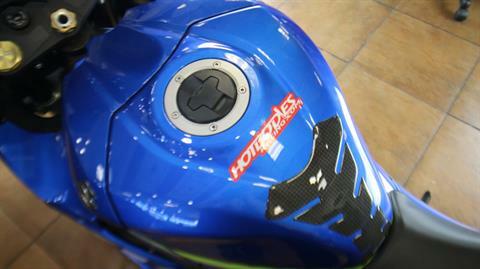 Suzuki’s Motion Track Anti-Lock Brake System is added to the GSX-R1000 ABS. The new lighter and stronger aluminum, twin-spar frame features quality components like the Showa BPF fork and rear shock, Brembo monobloc calipers and T-drive rotors, and a large full LCD display help the new GSX-R1000 lay claim to the title. 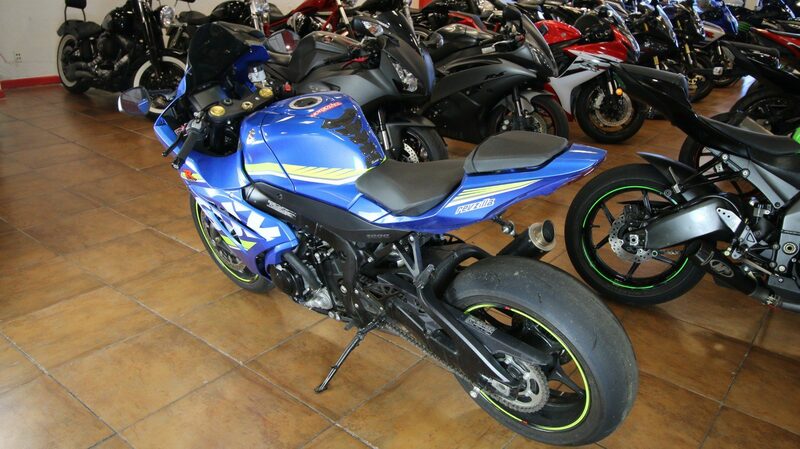 The King of Sportbikes is back, bow to the King. New 32-bit Dual Processor Engine Control Module (ECM) blends Suzuki’s vast street-going EFI knowledge with the intelligence from Suzuki’s race-winning MotoGP program. 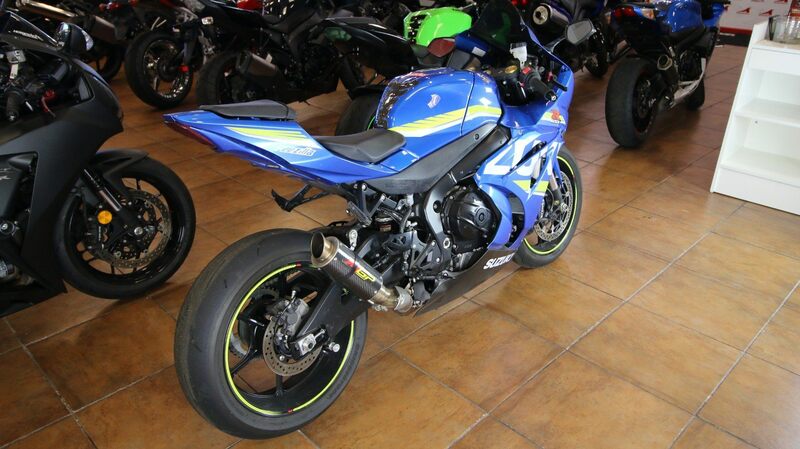 GSX-R1000 riders will get sportbike performance without peer while simultaneously receiving polished street manners. Using MotoGP knowledge, Suzuki has fitted an Inertial Measurement Unit (IMU) on the new GSX-R1000. The IMU provides six direction, three axis motion and position information to the ECM so instantaneous adjustments can be made electronically to the engine and chassis components that influence performance. New Ride-by-Wire electronic throttle bodies are precisely opened by the ECM to match the throttle grip rotation of the rider’s hand and the refinement from the IMU-influenced electronics. The result is a strong, seamless engine power delivery from idle to redline. The new and exclusive ten-mode, Motion Track Traction Control System (MT-TCS)*, with IMU influence, increases rider confidence by allowing adjustments to amount of intervention to match riding ability and surface conditions. Optional ABS**. 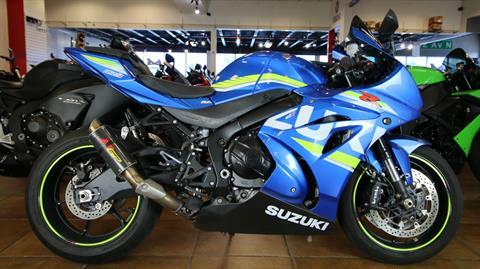 Exclusive to Suzuki, the new Motion Track Anti-lock Brake System brings additional control to anti-lock braking (ABS). Like a conventional ABS system, the Motion Track Brake System provides the appropriate amount of braking force for the available traction. When the IMU detects the rear wheel lifting up from extreme braking forces, the ABS control module will adjust the front brake pressure to reduce the rear wheel lift. 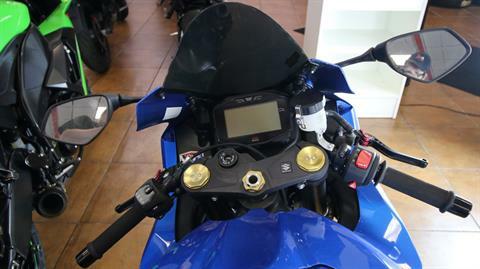 The new LCD Multi-function Instrument Panel was inspired by the GSX-RR MotoGP dash. This panel is laid out so the rider can easily see the tachometer bar, speedometer digits, and other essential operational information. This effective display is critical as it is the rider’s interface to the GSX-R1000’s advanced electronics. A new version of the three mode, Suzuki Drive Mode Selector (S-DMS) system lets the rider select the power output levels of the engine to match riding ability and conditions. The Suzuki Easy Start System simplifies start up for the GSX-R1000 rider as the ECM automatically cranks the engine for 1.5 seconds (or until it starts) with a momentary press of the starter button. There is no need to pull in the clutch lever if the transmission is in neutral. Once started, the ECM will control the electronic throttle bodies to maintain a consistent engine idle speed, whether the engine is cold or warm. The new, aluminum twin-spar style frame was designed using FEM analysis technology to place strength is the proper places, the new frame is also 10% lighter than the prior generation GSX-R1000. The spars of the frame are set 20mm closer to help improve aerodynamics, looks and to bring more comfort to the rider. All-new Aluminum Superbike-braced Swingarm has equalized bracing to the main beams to provide balanced support and movement to the shock absorber to improve racetrack handling while conveying a consistent suspension feel to the rider. 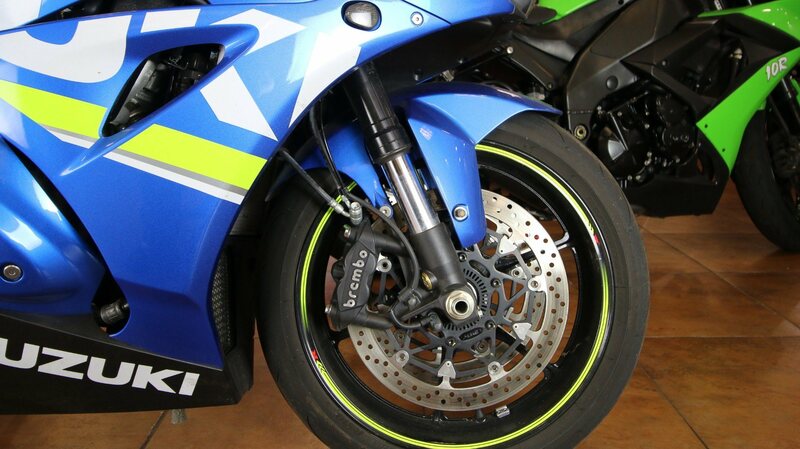 Racetrack-developed links connect the single SHOWA Remote Reservoir Shock Absorber to the braced swingarm. With spring preload, rebound damping, plus high and low-speed compression damping force adjustment the rider can tune the motorcycle to respond to riding style and weight. Superb suspension action is delivered by the fully adjustable SHOWA Big Piston Fork (BPF) which is renowned for damping force control that maintains front tire contact with the surface so the rider gets good sensory feedback while riding at a variety of speeds. BREMBO Radial Mount Brake Calipers provide the rider with strong braking performance combined with superb feel. The new BREMBO T-drive Brake Rotors feature two methods of attaching the 320mm floating disc to the carrier. There are five conventional floating rotor spools that maintain the rotor’s relationship to the caliper and five new-design T-drive fasteners. 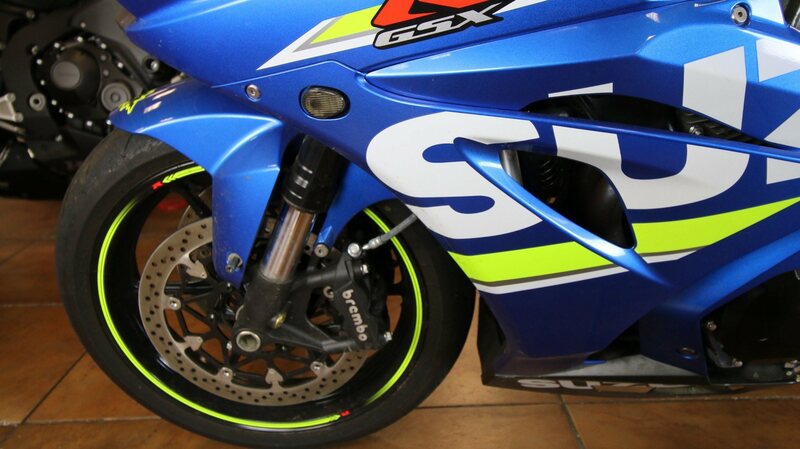 This combed attachment technique allows the rotor to absorb more energy so more braking force is available to a GSX-R1000 rider than ever before. *Optional ABS. Like conventional ABS, the Motion Track Brake System provides the appropriate amount of braking force for the available traction, with additional chassis pitch input from the IMU. When the IMU detects the rear wheel lifting up from extreme braking forces, the ABS control module will adjust the front brake pressure to reduce the rear wheel lift. Exclusive to Suzuki, new lightweight six-spoke wheels reduce unsprung mass and have been designed to handle the braking and drive forces that a GSX-R1000 can create. The track-day ready Bridgestone RS10 low mass tires, with a new higher 55% profile in the back, are premium high-grip radials that achieve excellent handling and stability. NEW Aerodynamic Bodywork was created by Suzuki styling designers and engineers using numerous wind tunnel tests to achieve a slippery shape and compelling appearance. Narrower than ever before, the GSX-R1000’s shape directly aids performance by improved handling and top speed on the racetrack. The new SRAD intake ducts are positioned closer to the center of the fairing nose, where air pressure is highest. The intake ducts are also larger, thanks to the compact LED headlight. The reasonable sport riding position is created by a carefully crafted relationship between the clip-on’s, footrests and seat. The top of the fuel tank is lowered 21mm to make it easier for the rider to tuck in on a racetrack straightaway. The seat height is an appropriate 825 mm (32.48 in.) and contributes the good rider interface that aids in guiding the motorcycle on the road or race track. The passenger seat can be removed and exchanged with an optional, color-matched solo tail cowl. The new LCD Multi-function Instrument Panel has an adjustable intensity, white-color backlight for great nighttime visibility and is flanked by LED indicators that include the turn signals, high beam, traction control, shift light, plus coolant temperature and oil pressure alerts. The new LED headlight is lightweight, bright and distinctive. This low-electric draw light has a narrow, stacked shape to allow the SRAD ducts at the nose of the fair access to the high pressure air created at higher speeds. 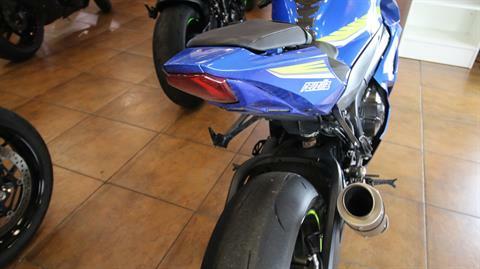 LED Combination Tail & Brake Light has a very low electrical draw and the vertically stacked shape permits the tail section to be narrow for better air flow at the back of the motorcycle. License plate is also illuminated by an LED light. New poly-function Start/Stop Switch combines the engine stop and start functions. 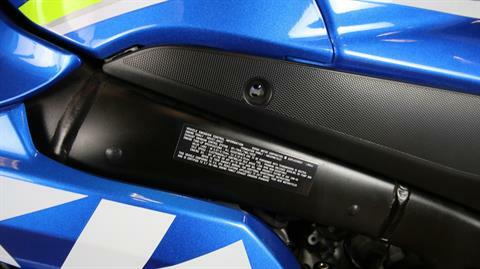 The switch is a fine complement to the Suzuki Easy Start system fitted to the GSX-R1000. The all-new, four-stroke, liquid-cooled, DOHC, 999.8cc inline-four cylinder engine is designed with a high level of top end performance plus strong low to mid-range power. 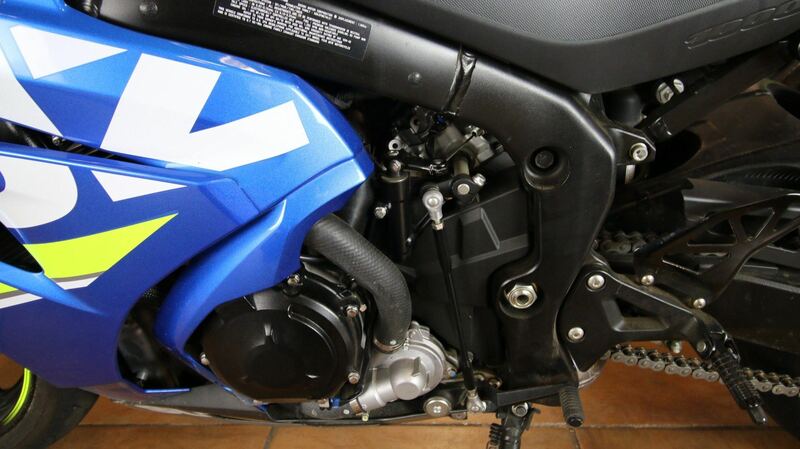 The crankshaft retains Suzuki’s Even Firing Order Engine legacy. Un-even firing order engines used in other motorcycles vibrate more while the GSX-R1000 makes good power at all engine speeds, runs smoother and reliably while emitting a screamer exhaust note. The short stroke engine has a 76.0 mm bore versus a 55.1mm stroke, yet is narrower than the prior generation GSX-R1000 thanks to effective design. The fresh-design engine has been rotated back and positioned in the frame to create optimal chassis dimensions for precise handling and to balance the motorcycle’s weight. The new and exclusive Suzuki Racing Variable Valve Timing System (SR-VVT) uses a centrifugal actuated mechanism on the intake camshaft sprocket to increase high engine RPM power without losing low-to mid-range power. The new design Suzuki Racing Finger Follower valve train weighs less than a tappet-style valve train for reduced friction and increased valve response at higher engine speeds. Aluminum pistons, 76.0 mm in diameter, were engineered with use of FEM (Finite Element Method) analysis, and are cast for optimal rigidity and weight. Suzuki Composite Electrochemical Material (SCEM) coated cylinders are integrated into the upper crankcase to reduce friction and improve heat transfer and durability. The high 13.2:1 compression ratio helps produce high horsepower. The cylinder head’s shallow combustion chamber minimize heat produced during operation. The EFI system uses Suzuki’s new Ride-by-Wire Electronic Throttle Bodies where the throttle valves are controlled by a servo motor for fast response to rider throttle grip input while delivering precise and smooth power delivery. Complementing the four primary fuel injectors in the throttle bodies are four Suzuki Top Feed Injectors (S-TFI) that spray fuel from the top of the air box directly into the intake funnels. This results in higher peak power, more efficient combustion, and a higher level of fueling control. To increase top end power without losing lower RPM performance, the air box is equipped with Staked Air Intake Funnels for the #1 and #4 cylinders. This simple design allows good air flow at all intake speeds without requiring a mechanism that adds weight or complexity. New design Suzuki Ram Air Direct (SRAD) intake ducts are used to exponentially increase the volumetric flow of air amount coming in the air box as road speed increases. The 4-2-1 exhaust system with titanium muffler is designed to help the engine deliver a wide range of performance with an exciting rush up to redline. The titanium muffler has a pleasing appearance while creating an exciting, distinctive sound. New design SET-Alpha exhaust valves are in the balance tubes between the #1 and #4, and the #2 and #3 head pipes. Actuated by a cable from the main SET-valve, the Alpha valves open at higher engine speeds and close at lower RPM to help the engine create high peak power without losing low and mid-range horsepower. The cooling system was designed using advanced analysis design so the coolant flows through the engine and radiator more efficiently. This design uses 400cc less coolant than the prior GSX-R1000, but the new system has better cooling efficiency while being more compact and lighter. *The traction control system is not a substitute for the rider’s throttle control. It cannot prevent loss of traction due to excessive speed when the rider enters a turn and/or applies the brakes. 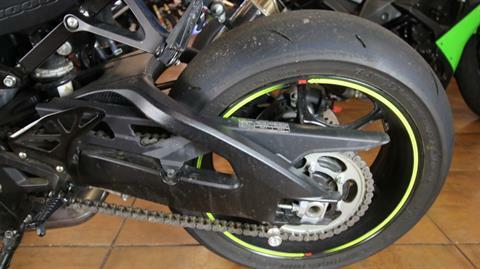 Traction control cannot prevent the front wheel from losing grip. **Depending on road surface conditions, such as wet, loose, or uneven roads, braking distance for an ABS-equipped vehicle may be longer than for a vehicle not equipped with ABS. ABS cannot prevent wheel skidding caused by braking while cornering. Please drive carefully and do not overly rely on ABS. All new 999.8cc liquid-cooled DOHC inline-four cylinder engine produces exceptionally high top-end power without sacrificing low to mid-range power thanks to a Variable Valve Timing (VVT) system, Ride-by-Wire Throttle Bodies and more. Advanced electronics such as an Inertia Measurement Unit (IMU), S-DMS adjustable power output, and Suzuki traction control, plus other performance features, increase racetrack and street performance. New design, twin-spar type aluminum frame is 10% lighter and more compact, with optimized rigidity for nimble handling and a high level of grip when cornering. Advanced suspension uses a SHOWA BPF fork and rear shock that combine with new BREMBO T-drive 320mm dual front brake rotors and Monobloc 4-piston calipers for extraordinary handling and stopping performance. Aerodynamic bodywork is sleek and stylish while housing a new, bright LED headlight and Suzuki Ram Air Direct (SRAD) ducts that feed a high volume of intake air for astonishing top speed muscle. 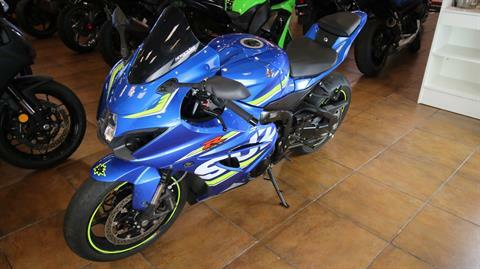 The GSX-R1000’s new cassette-style, six-speed transmission uses ratios carefully selected for optimal acceleration and top speed. Like the Suzuki GSX-RR MotoGP bike, this transmission can be removed as a complete assembly from the side of the engine and features vertically staggered shafts to reduce overall engine length. 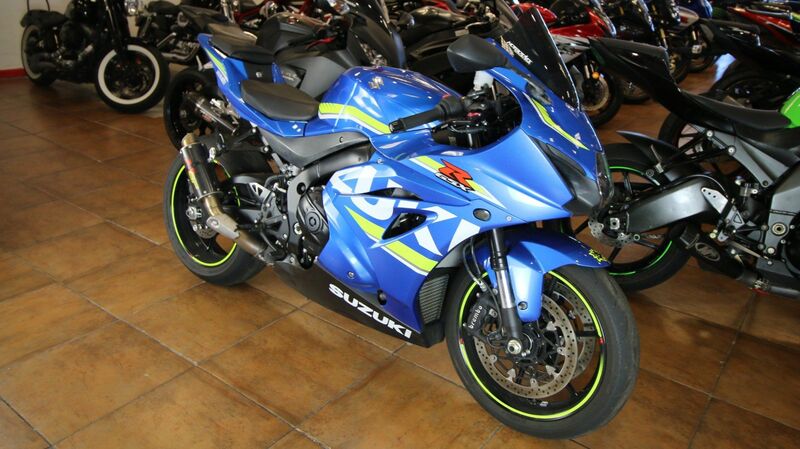 The primary gear ratio is lower compared to the prior GSX-R1000 for stronger acceleration. 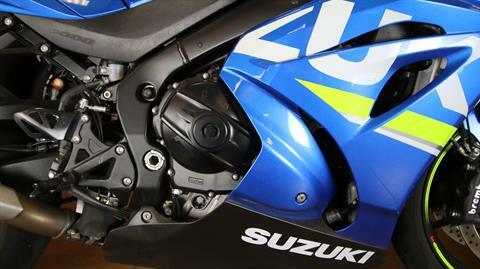 A new version of the Suzuki Clutch Assist System (SCAS) multi-plate, wet clutch is used. SCAS works like a slipper clutch during downshifts, while increasing pressure on the plates during acceleration. This smooths engine braking and lightens the clutch lever pull. To reduce weight, a new 525-size drive chain is used with a 45/17 final sprocket ratio that complement the larger, rear tire dimensions.